Q & A: Meet the fast & fierce new Philadelphia chapter! When Amy Cohen joined Hand in Hand, we were thrilled to have her experience and guidance for our #SanctuaryHomes campaign, an urgent and intense response to the anti-immigrant rhetoric and policies that were threatening immigrant communities everywhere, meaning it affected much of the domestic workforce as well. But none of us—least of all Amy—could pass up the chance to work on domestic workers’ rights and employer education and access in another community! In the past year, Amy’s groundwork has really begun to bear fruit, and we thought it was high time we introduced the broader Hand in Hand network to the growing, great chapter of domestic employers in Philadelphia. You’ll be as excited as we are when you see how much work they’re getting done. Q: Hi Amy! How did you come to join Hand in Hand? Amy: I’ve been a community organizer for years, in a number of different cities and rural areas. I’ve worked on all sorts of campaigns, from improving city schools to enacting progressive taxation to strengthening social security. As a parent, I’m really familiar with how challenging it is for parents to balance childcare and career. I’ve also appreciated quality care several times as aging family members have needed it. So Hand in Hand has been a tremendous opportunity to bring threads from my organizing and personal experiences together and work on issues I care deeply about. Q: What are you up to in Philadelphia? We’ve taken on a lot in a short period. We started working here less than two years ago, beginning by learning from other organizations about how they were approaching the work, from talking with unions for homecare workers, to organizing nanny employers. Last year we were a part of the national #SanctuaryHomes and #FamiliesBelongTogether campaigns–meaning we organized our own Playdate Protests locally to protest the separation of immigrant families at the border. Q: What was that like? The playdate-protest model, where parents are bringing their children and including them in the protests, is so energizing. The way this administration has been traumatizing kids is especially offensive to parents, but parents often have a hard time fitting political activity into daily life. This gave lots of people a way to not only make it work, but to bring those parts of their lives together. And with the announcements that have just come out, one after the other, from JPMorgan Chase and WellsFargo that they’re not going to bank the private prison industry anymore—it’s giving us all a real sense of our own power. Q: So what are Philadelphia Hand in Hand doing now? We have three big projects going on right now! First, we’re working with the Pennsylvania Domestic Workers Alliance, organizing private-pay cleaners and nannies. It’s less than a year old – they just started organizing this past August – and it’s so exciting. We send workers their way, they send employers our way. Together, we’re able to build faster and get stronger. Then, as a group of employers and worker-allies ourselves, we’re using Alia as a starting point for organizing more of our friends, family, and neighbors. Alia creates a way for a worker’s many different employers to each contribute a few dollars at a time, and this pool of money lets the worker get benefits like paid sick days. It’s really exciting how quickly you can make a big impact in the life of someone who supports your life. And last but absolutely not least, we’re advancing a bill of rights. Q: Wow, you’ve got legislation in motion already?! If Philly passes this bill, we’ll be only the second — and the largest! — city to pass this. It’ll cover even more people than Seattle’s. We just announced the bill on Thursday, at an event with both workers & employers speaking. We’re finding growing support for it from all sectors, and we feel really good about its chances of passing. Q: What size army does it take to get all this work done? We have a growing group of volunteers with a few dozen participating regularly, a few hundred contacts, and more every day. It goes to show you how possible it really is to make change: 1 person can be a better nanny employer at home, 5 people can collectively provide the house cleaner they all employ with benefits, and 20 people can be the start of changing this city’s labor laws to be more fair to childcare providers, house cleaners, and homecare workers. This March alone, we’re holding information sessions to introduce people to Alia, press events for the Bill of Rights, and doing outreach in neighborhood across the city. The ripple potential is huge. Q: How does this connect with life in Philadelphia more broadly? It’s part of a larger progressive shift that’s going on in Philadelphia … there are growing progressive alliances, and we’re figuring out how we relate to them and participate in the citywide conversation. Three great bills from councilwoman Helen Gym passed all at once: they touched on wages, housing, jobs. 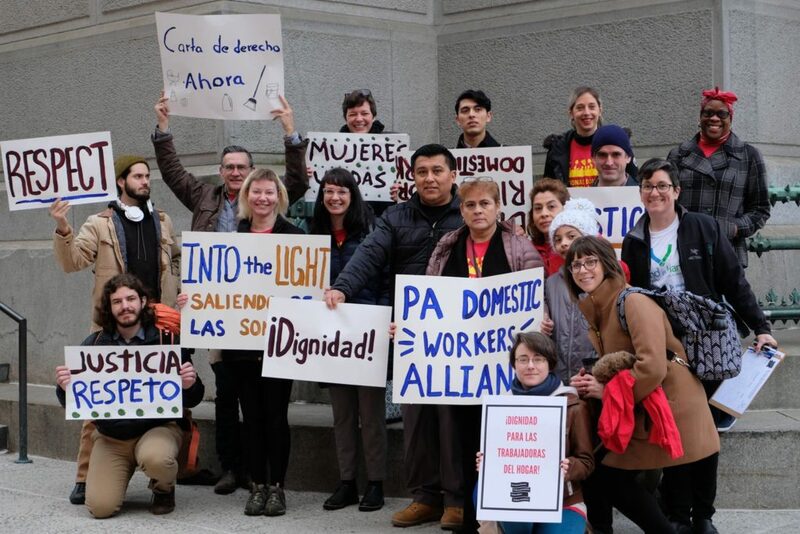 And in the new Alliance for Just Philadelphia, more than 25 grassroots groups are working to create aligned agendas before elections, and the Domestic Worker Bill of Rights is an important plank of their worker justice agenda. We’re telling a really broad story, that the issue impacts more than just the workers. This affects seniors and people with disabilities, families, everyone. This is a societal thing we all want to talk about together. I think a lot of the workers and employers working together here can really feel the momentum. If you want to be involved, sign up for the Philly chapter’s email list. Are you the best employer you can be? Use the Employer Checklist to find out!